I have to share this photo. The Wee Rob canoe that’s under construction is 14′ long and was designed by the esteemed Iain Oughtred. In wooden boat circles, you almost need to genuflect when you mention Iain’s name, such is the respect held for this designer. This is, believe it or not, one of three canoes that’s currently being built by my beloved. 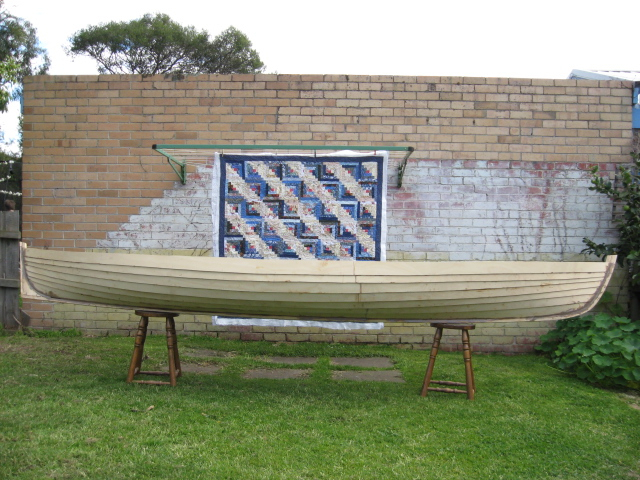 Oh, and if you happen to be in Australia and in the market for a canoe, please get in touch. We have at least one more than we actually need. 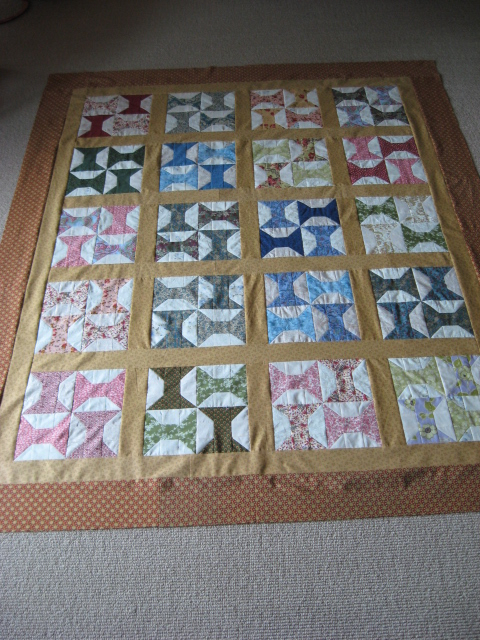 The log cabin quilt was quilted by Pam Hammer and still needs to be trimmed and bound. 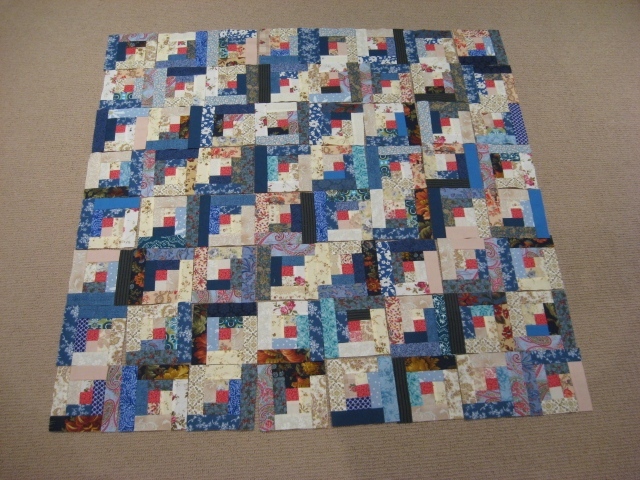 I’m thinking plain blue for the binding as the quilt is more than busy enough already. I’m amazed how good it looks from a distance. Up close it just looks like a mess. 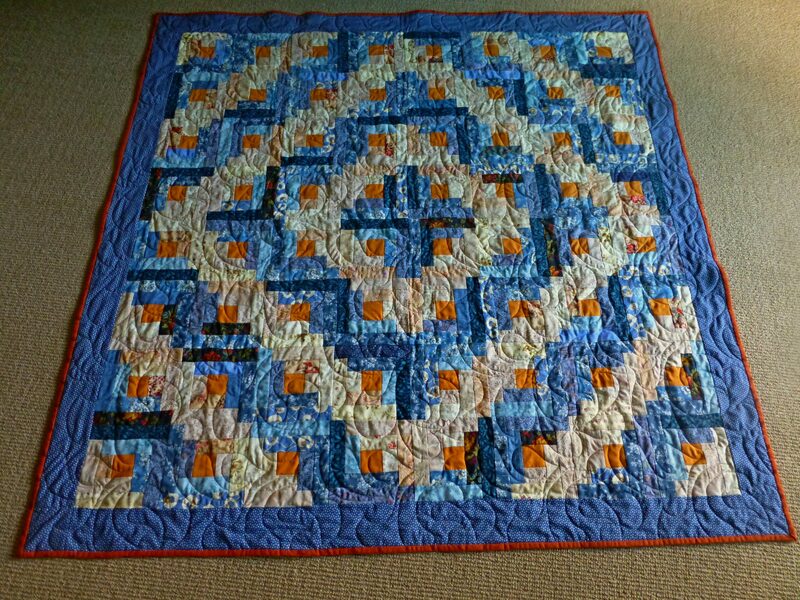 The tumbling spools quilt has been bound and this one will be staying with us. I live the fact that its colourful but doesn’t yell. 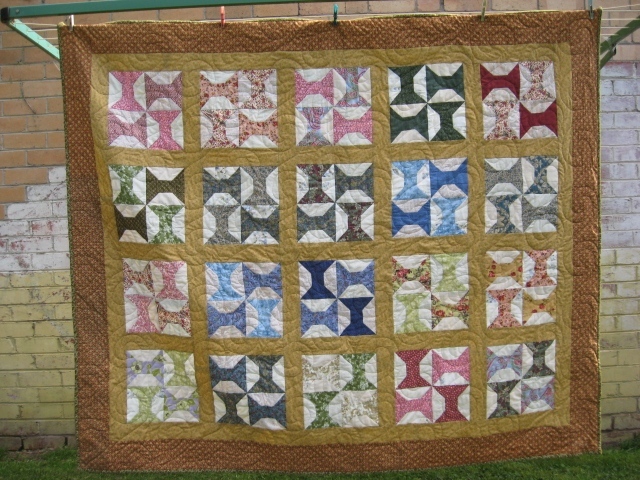 The quilt was professionally quilted by Pam Hammer. The top is ready to go off to the long arm quilter. I added one more set of logs since laying out the blocks as the top was just too small to be of any value to anyone I know. It turned out to be a bit of a slog adding that extra row, but with a few early mornings and a bit of sewing in the evenings before bed, I finally made it. 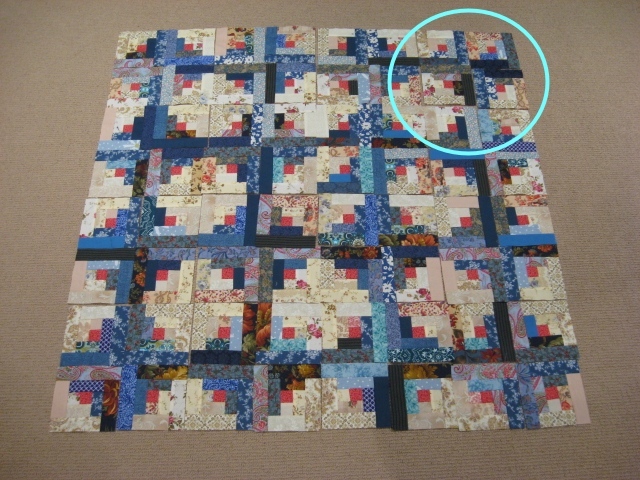 I chose a simple navy blue border, hoping it would help the quilt look framed and finished. I decided to stick with Fields and Furrows because I enjoy the optical illusion but I do see why Michelle at Sleepy Cat Hollow says she likes the Barn Raising pattern best of all. If you check out the collections at the International Quilt Study Center & Museum you’ll see that Barn Raising has been a popular choice over time. Searching their collection provides hours of entertainment and inspiration. The advanced search is awesome, as it offers search terms like primary technique or dominant pattern. It’s just heavenly for those of us who are search nerds. 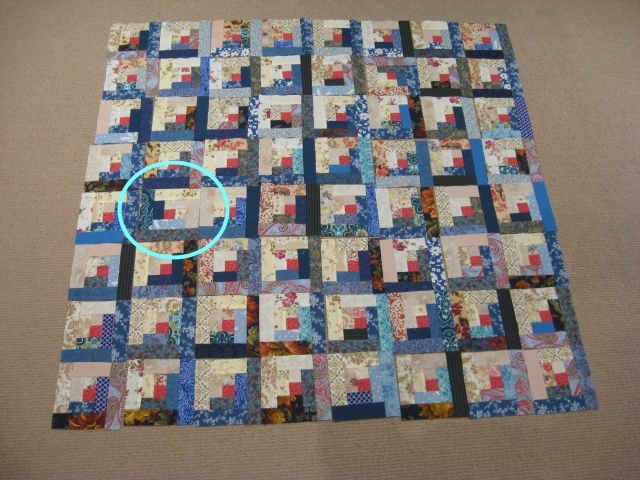 The backing is a pieced square in a square and you can see some of the backing peeking out from under the top in the photo. 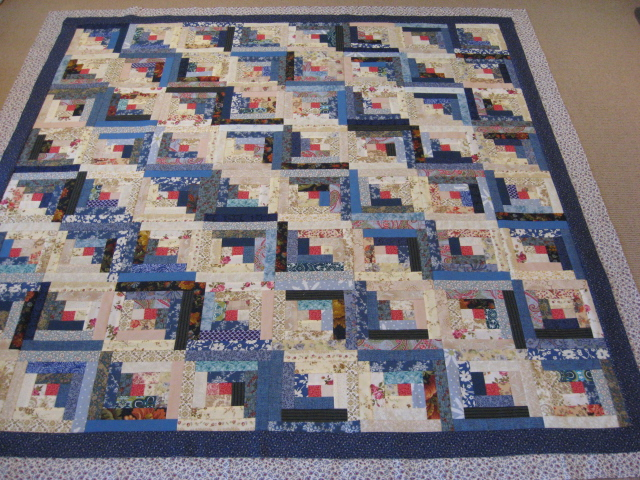 I have completed 64 scrappy log cabin blocks and trimmed them to 5 1/4 inches unfinished. This is the perfect time to experiment with some layouts and I have discovered one thing already. It’s very easy to make a mistake in laying out your pattern. Taking a photo and examining that photo on your computer screen is a great way to check your layouts. Inconsistencies just seem to leap out in a way that they don’t when the blocks are laid out on your design floor. Here are a couple of examples, with the problem areas circled. I could pretend it’s all part of the process pledge and that I left these inconsistencies in just to show you, but that would be a lie. In fact, I just didn’t see these problems until I had the images on the big screen. And here’s Fields and Furrows, without any errors, as far as I can tell. Suite 101 has five popular layouts that are a handy reference. Over the next few weeks I plan to build another set of logs around these blocks to increase their size. The quilt right now would finish to about 40 inches square and that’s too small to be useful to anyone I know. If you have a preferred log cabin layout, please leave a comment and tell me what it is. While I’m not particularly drawn to log cabin blocks from an aesthetic point of view, there are a couple of things I like about them. Firstly, you can arrange them in all kinds of patterns, at least if you go with the light/dark contrast that is most common in log cabin blocks. And it’s a traditional block. I borrowed The Ultimate Log Cabin Quilt Book by Maggi Mccormick Gordon and Patricia Cox from the library last month and that was my inspiration. I wouldn’t want to own this book as an entire book about log cabin blocks is a bit much of a good thing, but it was a good one to borrow. 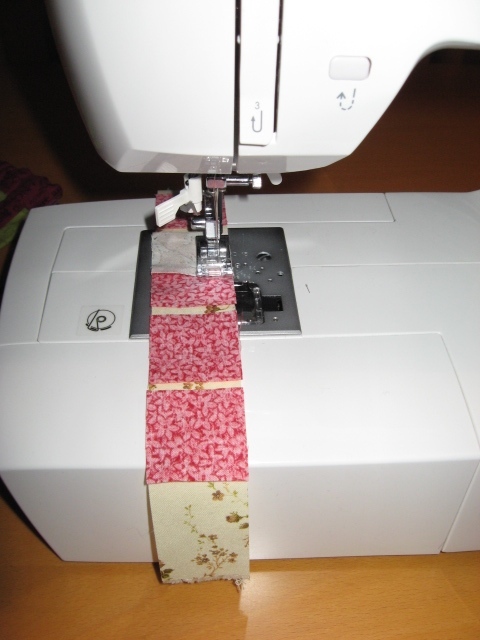 It covers a number of techniques including strip piecing and foundation piecing on muslin and there are many, many layouts to study. Log Cabin Blocks in Progress - Note the seam ripper: Essential! I decided to strip piece around a 1 1/2 inch square red-toned centre, to reflect the tradition of a red or yellow symbolic central hearth, around which the rest of the block is constructed. You start with a pile of 1 1/2 inch square centres and a couple of piles of 1 1/2 inch strips. I chose blue and neutrals because I seemed to have lots of odd bits of both lying around and I really wanted to move them on. 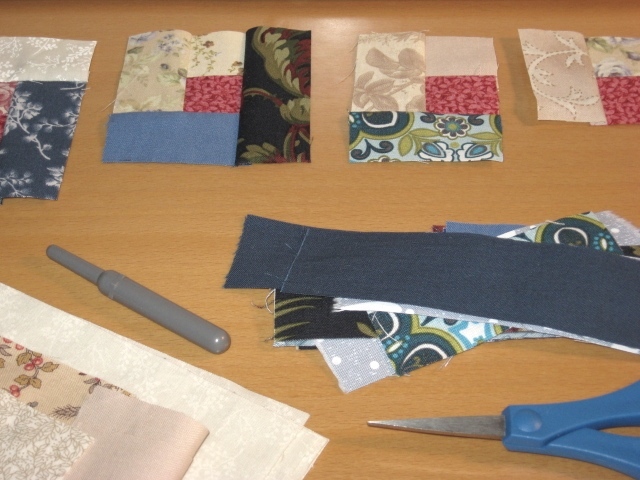 This is an excellent way to use up scraps and it really doesn’t seem to matter whether you’re working with a lovely or an ugly fabric. It all just comes together. My goal is 64 blocks, that is an 8 by 8 square design as that gives masses of flexibility in how the finished quilt comes together. Funny how you can start a day with a little experiment and end it with 52 blocks still to complete. I did it. I just added the last border to my tumbling spools quilt top. This one has been close to a year in the making. I purchased the magazine that had the pattern some time at the start of 2010 and posted about it in February. It measures roughly 73 by 62 inches, which makes it my biggest top so far. It will be going off to the long arm quilter as soon as she’s back on deck after the holidays. She likes to take a break over the hottest months of summer. Fair enough too. I’m proud of the workmanship in this top. It lies flat and I can see in it how I have learned new skills and improved my consistency since I started piecing it about ten months ago. No two blocks are identical. I had to re-make one block to accomplish that. This is the most forgiving pattern ever. There are lots of points that are a bit cut off here and there or that don’t quite reach the corners they should, but you can’t tell. Love that.